Get your mind out of the gutter! 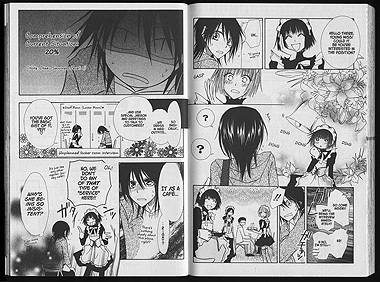 This is not that kind of manga! Sure, there are maid outfits, cosplay, handcuffs, cute high school girls, and psychos but it's all sweet and innocent. 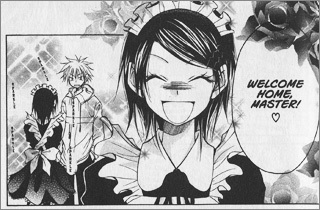 Ok... that did not come out any better than saying the title: Maid Sama! Misaki Ayuzawa worked very hard to get where she is at. I'm not talking about the maid cafe where she works part time but being the Student Council President at Seika High School. Seika High used to be an all male school and when the school administration decided that it needs a feminine touch along with the new female students that are coming in, they asked their best female student to step up to the plate. 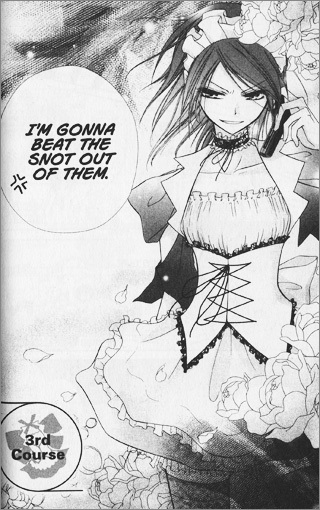 Luckily for them, Misaki is a ball-buster and loves nothing more than to clean up the school with the blood, sweat, and tears of the male students. Her dad ran out on the family and left huge debts behind for her and her mom to deal with; do you really blame her for hating men after that? Besides, the way she figures it, the guys probably won't work on their behavior and cleaning up the school if she doesn't scream, yell, threaten, and beat them up any way so she might as well skip the civilize, logical, reasonable, nice, sweet ways. 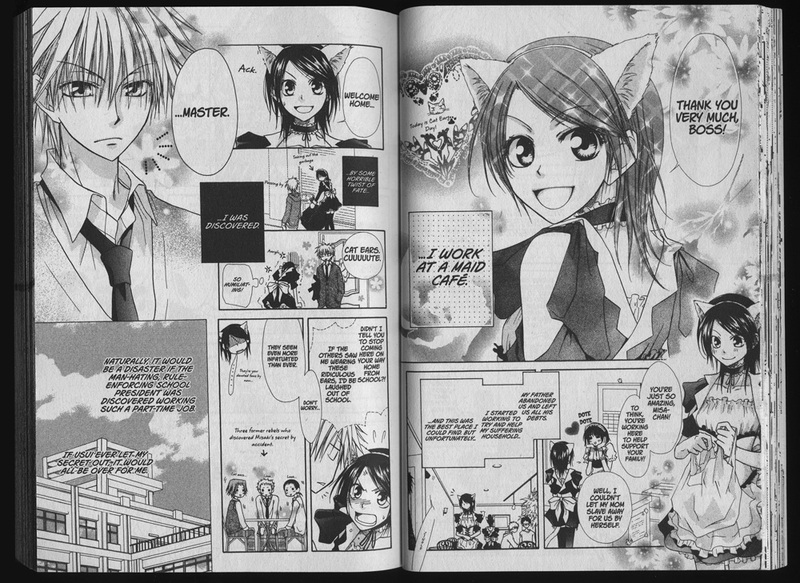 Of all the men she hates, she hates Takumi Usui the most. She doesn't want anyone from school to know that their council president is a maid and guess who just waltzes in as a patron? He doesn't tell anyone about it though; he just shows up day in day out during her shifts and watches her. 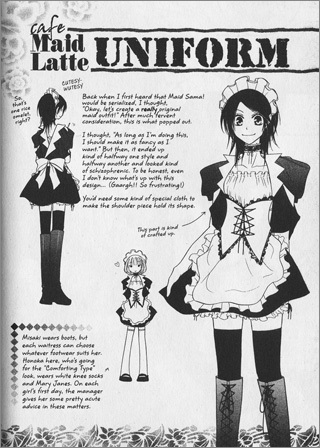 He's so much so a regular "Master" at Maid Latte that he saved up enough store points to take a picture with her in her maid outfit. Talk about blackmail picture... To make things worse, he took her number one spot in having the best grades at school and he is the most popular guy at school with the boys and the girls. Misaki is not petty but she just doesn't like to lose to a guy that makes her feel inferior. In her words, "It feels like while I'm frantically running my hardest... You've already sailed through the same stretch, outrunning me easily. And every now and then, you turn around and taunt me." How can she really hate him though? He is the only guy in school that isn't afraid of her and actually tries to get to know the real her: the Misaki Ayuzawa that isn't the ball-busting President strutting around school, torturing all male students, and rescuing the girls in distress or the Misaki Ayuzawa that isn't the cool, strong-willed maid that does her job but does not give her loyalty to any Master who hasn't earned it. He was the only one that noticed her getting sick and was around to catch her when she passed out. He was the only one that noticed the psychos that were watching her and still worried for her even though he knows she can probably take care of herself. And what man is ever willing to jump off a building to protect your secret? Sure, he'll lie, cheat, threaten, and occasionally dish out money to protect it but how many would jump off a building, hope to grab onto a tree to break his fall into a small fountain just to pick up the blackmail picture that you think could ruin your life? 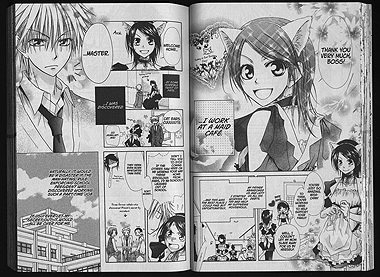 Below: Double page spreads from Maid Sama! (click on each image to view at full size). 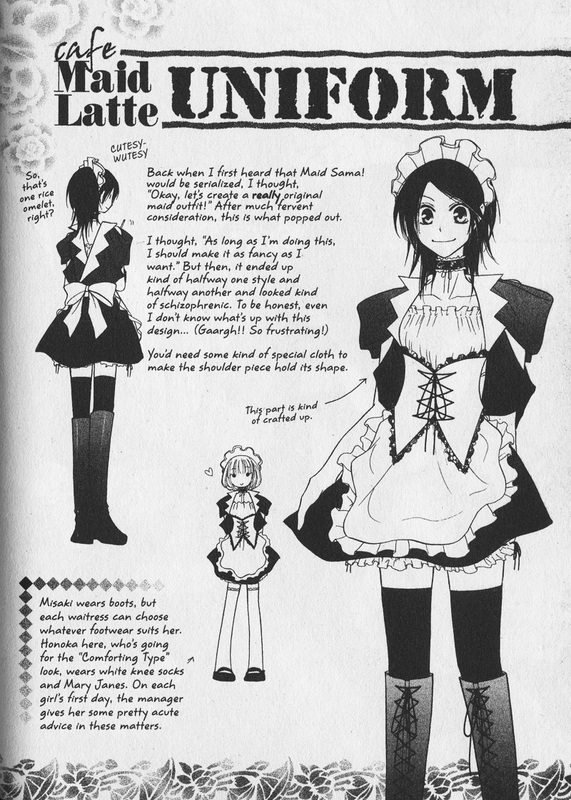 Below: Everything you wanted to know about the Cafe Maid Latte Uniform but were afraid to ask from Maid Sama! (click on the image to view at full size). 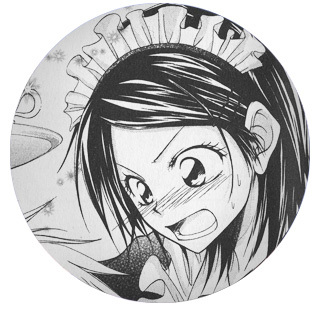 Below: Artwork from Maid Sama!